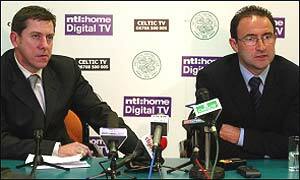 Celtic manager Martin O'Neill has ended intense speculation surrounding his future by agreeing to stay on at the club. O'Neill has signed a new 12-month rolling contract, which takes place with immediate effect. "I am delighted with this agreement," O'Neill told the club's official website on Wednesday. "With so much to look forward to this season, both domestically and in the last 16 of the Uefa Cup, I am hoping that the winter break has renewed everyone's appetite for the challenges ahead. "On the wider front, naturally having experienced Champions League football last season, this is something we would very much like to be involved in again. "This will be high on our agenda for next season." Celtic chief executive Ian McLeod is also delighted that months of speculation have finally ended. "The board of Celtic Football Club are extremely pleased that Martin has agreed to this new contract," said McLeod. "The speculation surrounding his future at the club has been brought to such a positive conclusion. "We are now looking forward to continuing our recent successes on the field as we maintain our challenge both at home and in Europe with Martin at the helm." O'Neill has been a huge success since arriving at Celtic Park from Leicester City in the summer of 2000. In his first season in Scotland he lifted the domestic treble and he successfully defended the Premier League title last term. O'Neill's contract had been due to expire at the end of the season and talks regarding a new deal have been dragging on for several months. The manager's failure to appear at Celtic's winter training camp in Miami last week led to intense speculation, with O'Neill being linked with several sides in England. Celtic supporters are sure to be delighted that O'Neill is not leaving Glasgow this summer, but will have concerns about the short-term nature of the new deal. "For the moment at least the speculation should die down"
"We are delighted Martin has signed this contract"
"I have a lot to look forward to"
Links to more Celtic stories are at the foot of the page.